Montana has long been synonymous with fly fishing. Southwest Montana and its Upper Missouri River drainages are considered the most diverse, beautiful and productive rivers anywhere in the country. From its big freestone rivers like the Big Hole and the Jefferson, to technical tailwater like the Beaverhead and Madison, and great wade fishing options on the Ruby River; opportunities for fantastic trout fishing are endless. Close your eyes and dream up the perfect trout river. The Big Hole is that river. The quintessential freestone trout stream. Its small size can be deceiving. This is a classic western tailwater with one of the highest densities of trout in the country. 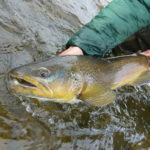 The legendary “Fifty Mile Riffle” evokes a deep connection with anglers and this river’s status is cemented as the most legendary of all western trout rivers. A river for the solitude-loving angler who also seeks a picturesque setting and a chance at true trophy trout. A phenomenal dry fly river with no boat ramps, thereby offering wade anglers access to seemingly endless numbers of undisturbed trout-filled pools.